Get 97% Engagement on All Your Marketing Messages with SMS. It’s unthinkably easy to launch an SMS campaign. To compete in today’s crowded marketplace, it feels like you have no choice but to employ aggressive marketing tactics, investing time and money into mastering countless new platforms and mediums. From display ads to social media to SEO, you feel as though you’re on a never-ending roller coaster of new marketing trends and technology, one of the latest of which is SMS marketing — sending texts with targeted marketing messages directly to your contacts’ smartphones. This new medium could take weeks to master, thousands of marketing dollars to test and before you can even launch your first campaign, you need to test-drive various costly SMS marketing apps only to settle for yet another tech solution that costs more money than it brings in. The juice just doesn’t seem worth the squeeze when you can just fall back to familiar marketing tactics that, while not remarkable, at least bring in some leads for little cost. Aside from your pockets not being deep enough, there seems to be little room for businesses with small teams to compete with the bigger brands who have already mastered the medium. Very few small businesses have even tried to break into SMS marketing. The market appears to be cornered by elite corporations like Coca Cola and Calvin Klein. You wonder what offer or content could possibly be compelling to your audience that the other guys haven’t already tried. Plus, SMS marketing seems spammy and intrusive. Though you’re confident your leads and customers love your brand, sending them marketing messages on their smartphone — the gadget their eyes are glued to constantly — could shake their affinity for you and repel them for good. What’s the point of branching out if the risk seems greater than the reward? You’ve fought hard for the leads you have; why potentially shoo them away? In the end, you’re utterly mystified by SMS marketing. Maybe the medium just isn’t worth it, and you should stick to familiar marketing channels. Most small businesses have fallen prey to the myth that branching out into multiple marketing mediums means spreading themselves thin. There’s a lot of misinformation circulating about SMS marketing regarding its demographic and contextual limitations, but it represents a substantial whitespace in marketing in which few small businesses have claimed a stake. This, in itself, has sprouted negative connotations. The fact that only 36% of businesses depend heavily on SMS in their marketing campaigns only unnerves you further. Although it may not seem like it, the truth is it’s unthinkably easy to launch an SMS campaign as well as integrate SMS into your existing marketing campaigns. It all comes down to knowing your audience and sending the right content to the right people at the right times. With the affordability and versatility of today’s marketing automation software, peppering SMS into your existing campaigns requires almost zero extra effort. On top of that, mobile marketing is actually eagerly sought out by consumers. According to SMS Marketing Demystified, 70% of people say they’d rather receive offers on their mobile phones, and those offers are 10 times more likely to be redeemed than traditional coupons. People carry their cell phones everywhere they go and check them dozens of times per day, so if you use SMS to reach them, you’re targeting them exactly where they prefer it most. You can use text messages for appointment reminders, birthday and holiday greetings, exclusive discounts, customer service or even to interact with customers at a live event. According to SMS Marketing Demystified, 90% of SMS messages are read within three minutes upon receiving them. This is because the smartphone has become an extension of the body; owners are extremely attached to their devices. Today’s consumers are truly eager for brands to use this medium to contact them, especially if it’s with useful information or deals. Brands such as Express and Chipotle have found great success in giving customers the option to opt in to their SMS contact list for discounts and promotions. 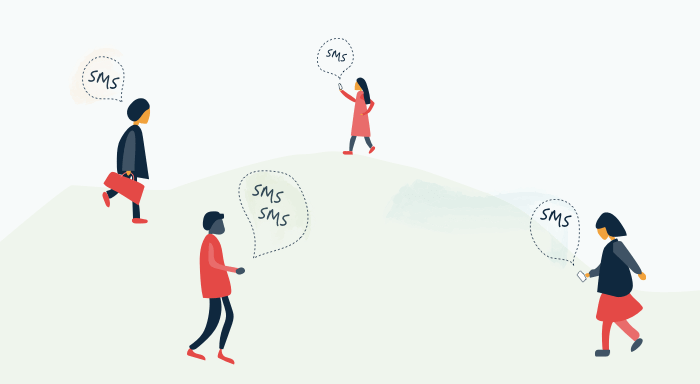 The engagement rate offered by SMS is six to eight times greater than email marketing, since 98% of SMS messages are read, compared to only 22% of emails. SMS messages give your customers a notification sound or vibration so you can get their attention instantly and get your message seen. Offers and coupons in SMS messages are far more likely to be redeemed by customers so you can spur more customers than ever before to participate in your next special promotion. There are no barriers or spam filters to worry about when sending SMS messages so you can be confident that every message you send is reaching your customer right away. SMS opt-in is a low-hassle way for users to share their contact info so you can connect with as many potential customers as possible at your next live event or speaking opportunity. Most SMS messages are read immediately so you can run campaigns in real-time and encourage customers to take action now. SMS isn’t limited to recipients of just one or two demographics; it encompasses them all. If you want to find out more about how you can start using SMS to get those smartphone-loving customers more engaged than ever, check out SMS Marketing Demystified.